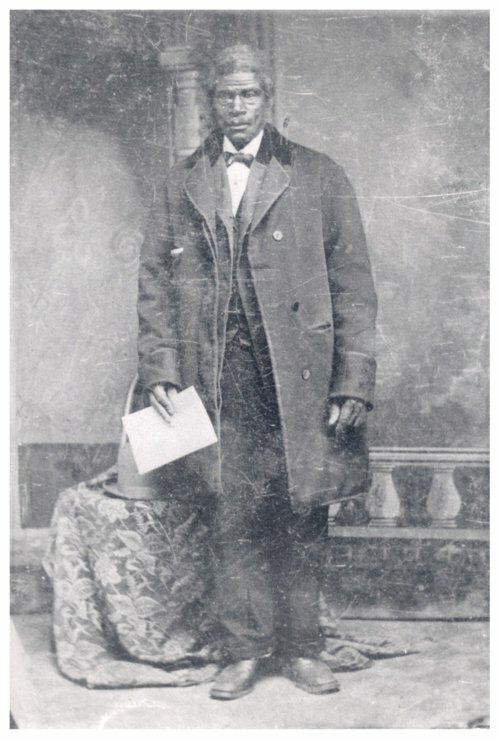 This is a photograph of Columbus Johnson, who lived in Dunlap, Kansas. He was born in Maryland, the child of a free man and a slave woman who was purchasing her freedom. His mother died when lightning struck a tree, and Columbus was taken to Tennessee where he was auctioned. Johnson learned several trades including harness making and carpentry. He could read and write and frequently read newspapers. While employed at the Braham Mill, he met and married Josephine, a 13 year old slave girl. Columbus Johnson served in the Civil War, and when he was mustered out, he returned to Gallatine, Tennessee. In 1869, Benjamin Singleton, Columbus Johnson and others organized the Tennessee Real Estate Homestead Association. They learned that homesteads were available in Kansas. Johnson went to Topeka where he was active in the Kansas Colonization project with Pap Singleton, under the auspices of the Freedman's Aid Society. His wife and family joined him in Topeka. In 1884, he moved the family to Dunlap where he was active in the community. In June 1884, Johnson and five white businessmen organized the Farmers Bank of Dunlap. He was a trustee in the St. Paul Methodist Episcopal Church and one of the shareholders and organizers of the Dunlap Colored Cemetery Association. Johnson died October 17, 1894.